Tumamoc Hill, the large peak west of downtown Tucson and to the north of A Mountain, is familiar to many Tucsonans. Hikers trek up Tumamoc's paved road to the University of Arizona's Desert Laboratory. The rough-hewn stone lab itself has been in operation for more than a century under various owners. But long before then, Tumamoc was prime real estate for local residents. Archaeologists from the Arizona State Museum, led by Suzanne Fish and Paul Fish, have been investigating the trincheras on Tumamoc, stone houses, terraces, walls and other structures that encircle the peak. Their excavations and data analysis are illuminating the two main prehistoric villages occupying the peak. It's easy to see why these early residents found the site appealing. From the top of Tumamoc are views spanning the entire Tucson valley, with other landmarks such as Kitt Peak, Baboquivari Peak and Picacho Peak in clear view. Most of the archaeology of Tumamoc Hill has been mapped out over the last 30 years. Early residents of the hill had cleared out areas for small living spaces. The large walls that surround the peak are thought to have been built in part for defensive purposes. A bit of a surprise came in 1985 when the UA Archaeological Field School, led by Suzanne and Paul Fish, discovered a site that substantially predated the Hohokam settlements in the area. Conventional wisdom at the time was that pottery and corn cultivation arrived in the area at about the same time. But the Fishs' excavations showed that people at Tumamoc were farming corn long before the everyday use of ceramics. Subsequent excavations, in fact, have established a long sequence of farm activity predating the Hohokam and their decorated pottery. Other prehistoric sites in the Southwest and northwestern Mexico exhibit this style of architecture as well. Beginning in about 800 B.C, the Cienega phase terraces at Tumamoc may also have been the first public construction projects in Tucson. Moving rock to create walls, as well as clearing and back-filling areas into level space, strongly suggests that completing these structures required a strong coordinated effort. The larger boulders in the walls almost certainly took more than one person to transport and move into place. Paul and Suzanne Fish write: "Tumamoc's eastern summit terrace at a minimum, and likely the massive linear features as a whole, constitute the earliest known ‘public architecture' in southern Arizona and possibly in the U.S. Southwest, in the sense that their construction was a sustained and coordinated enterprise entailing a communal-level investment of labor. Up to that time, Early Agricultural Period farmers in Tucson had only come together at a comparable scale of effort to construct irrigation canals." A later occupation, the Tortolita phase from about A.D. 475 to 500, was likely the largest village of its kind in the Tucson area. Byron Cummins, the first head of what was then the archaeology department at the UA, now the School of Anthropology, reported on his findings in a 1919 newspaper article, and estimated at least 250 structures there. That number unfortunately has gone down as modern human activity has increased on the summit. Over the last decade, ASM's more sophisticated mapping techniques, including aerial cameras mounted on booms, have helped reveal the complexity of later occupations on Tumamoc. Houses had short, often communal walls with floors dug down to the underlying cement-like caliche, and small gardens outside the front door. The Tortolita phase village with its large public areas, eclectic pottery sources, expansive views and secure defensive posture likely made it a center of regional trade and activities. 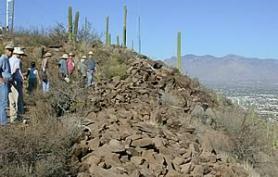 More about UA excavations of the Tumamoc Hill trincheras is online at the Arizona State Museum's website.